There are so many unique things to do on the North Island of New Zealand. Of course, as is always the case with vacations, it’s impossible to fit everything. When putting together your North Island New Zealand itinerary, we know it’s important to leave plenty of time to see all the quirky and fun things the island has to do, while not wasting single moment. Be prepared though, there’s a lot of driving involved in getting around the island (some of it on rather narrow and bumpy roads), but the endless rolling green pastures, sheep farms and unusual attractions along the way are all part of this truly incredible experience. We’ve put together a full 7-day itinerary of the North Island so you can get around to and see everything it has to offer. Of course, if you have less or more time, you can trim and stretch the itinerary to fit your needs. We recommend starting your journey in Auckland and ending Hawke’s Bay for some wine tasting. If you don’t want to include the wine tasting, the Hawke’s Bay area is still worth a visit, or you could go directly on to Wellington and spend a day there instead. You can make this a round trip back to Auckland, or fly out of Wellington. Either way is about the same distance back. ⇒ Check out this post for a few romantic destinations in New Zealand. Being a major metropolitan city, Auckland has an immense list of attractions for tourists. What you spend y our time on depends a lot of what you’re interested in. You could go to the zoo, check out the art scene, do some bar hopping… the possibilities are endless. Below you’ll find the top 5 attractions that most visitors fill their Auckland itinerary with. Just look up and you’ll see the Sky Tower hovering over the city. This is one of the first things people usually want to do in Auckland. You can purchase tickets to go up and look around the 360-degree views of the city, have a coffee in the cafe, eat at one of the restaurants (one is revolving), and even bungee jump off the platform on the 53rd floor (get tickets here). If you’re not daring enough to bungee jump, there’s also a pretty cool Sky Walk experience (don’t worry, you’re securely fastened to safety lines). Details: Plan for around 1.5-2 hours here, unless you stay for a meal or bungee jumping. It’s open 9am-10pm (May – Oct) and up to 11pm the rest of the year . Tickets are $29 NZD (around $20 USD). Far from a normal type of modern art gallery, the Toi o Tāmaki gallery is housed in a very impressive Chateau-style building from the 19th century. There are four floors of exhibitions that include an array of national and international art, plus Maori portraits, dating back as far as the 10th century. It’s definitely worth a look around (if you don’t mind the steep prices). Details: Plan for around 1 hour to see the displays. Open daily from 10am–5pm (except Christmas). The museum is free to New Zealand residents (with proof of ID) and $20 NZD for international guests. When you’re downtown, you have a couple of choices for museums, so you can pick the one that fits your interests. There’s the Auckland War Memorial Museum, the New Zealand Maritime Museum, and the Museum of Transport and Technology. One of the top (FREE) things to do in Auckland is visit Mount Eden. It’s a dormant volcano that is covered in grass. You can park at the base and walk up to the top, where you’ll find incredible views of the city. It’s the highest natural point in the city, and a good place for a bit of sun and relaxation, or maybe even a picnic. Located just off the coastline of Auckland is this fascinating volcanic island that contains many nature trails and hikes, plus stunning views. You have to take a Fuller’s ferry ride to get out there, but it’s worth it if you enjoying hiking. Once you get off the ferry, you can immediately set off on the Summit Track, which takes goes past lava fields and a pohutukawa forest on the way to the summit (fitness required!). If you’d rather take a guided tour to the island (one that includes a 4WD tour of the island), you can book a half-day tour that includes the ferry trip (book here). Locals and visitors both enjoy a day (or half-day) trip out to Waiheke Island, which is Auckland’s best kept wine secret. The island is covered with beautiful vineyards and there are at least 30 cellar doors dispersed around the island. You can get there on the Fuller’s ferry, and then take the Hop on Hop off bus, or the local public bus to get around. ⇒ We particularly like this 4-hour food and wine tasting tour of Waiheke (book here). You may not have enough time in Auckland during your two days to cover the activities above, but we wanted to give just a few more ideas of things to do in Auckland, just in case the ones above don’t sound interesting or aren’t available while you’re there. See below for a few more popular Auckland attractions. For comfort, luxury and convenience, you can’t beat the SkyCity Grand Hotel. It’s right in the middle of the action in Auckland, so it’s super easy to get everywhere you want to (downtown, the ferry terminal, restaurants). This hotel also has a casino and a spa. ⇒ Read reviews on Trip Advisor or book your stay. If you’d rather go a bit more casual with your dining, definitely check out Depot Eatery & Oyster Bar. They specialize in oysters, but that’s not the only thing on the menu, by any means. Some of our favorites are the smoked brisket tortillas, NZ meat board, and skirt steak. They also have a great wine menu. No reservations. Even more casual, don’t miss the Fast Food Garage. It’s just a few blocks from Depot. They specialize in fast food made good. You can get burritos, burgers, tacos and even sundaes. It’s a fun spot to hang out and the food’s fast, cheap and good. The first stop of the day is at Waitomo Glowworm Caves. The caves are quite fascinating and an adventure you won’t want to miss. Then it’s on to Hobbiton. Even if you weren’t really into Lord of the Rings, the day trip to Hobbiton is very much worth the time. It’s a fun and cute little village of hobbit houses you can walk through, plus you can visit the Shire’s Rest for a meal. I can’t say I’ve ever wanted to be in pitch darkness surrounded by tons of tiny bugs, but floating through the Waitomo Glowworm Caves wasn’t at all creepy as I had expected. The glowworm, Arachnocampa luminosa, is unique to New Zealand, and there are thousands of the tiny creatures in these caves, radiating light like a luminescent dome above your head. The boat ride isn’t long, but riding along in a boat in silence with only the glowworms to light the way is pretty cool. After the ride, there are other caves to explore on the ground. Just a five minute walk away is Aranui Cave filled with stalactites, stalagmites, flowstones and amazing rock formations that have been forming for thousands of years. You can take anywhere from an hour to 5 hours here, depending on the activities you book. ⇒ Book your tour through the Waitomo Glowworm Caves here. ⇒ If you’d rather embark on a bigger adventure, we recommend booking this tour where you can go cave tubing and/or rappelling into the caverns. If you’re a fan of The Lord of the Rings and The Hobbit, then it’s mandatory that you visit the Hobbiton Movie Set. The hobbit village was completely rebuilt for The Hobbit on the private farmland where The Lord of the Rings was filmed in 2007, and it will remain there as a permanent fixture. The two-hour tour takes you through the hobbit village, past the homes of Samwise Gamgee and Bilbo Baggins, up to the magnificent tree on the hill, and across the water to The Green Dragon Inn, where you can stop for a drink and their famous beef and ale pie. I don’t know why movie sets hold such allure, but it’s a really fun experience to be able to walk around Hobbiton like it’s a real place — because it is! PRO TIPS: Pre-booking your tour is essential. Our tours can sell-out well in advance so please pre-book to avoid disappointment. ⇒ Book your 2-hr guided tour of Hobbiton (includes a drink at the Green Dragon Inn). *This is a good price for this tour – it’s quite a bit more on sight. You should have plenty of time to drive on to Rotorua for your overnight (see below Day 4-5 for more information on where to stay in Rotorua. However, if you want to stay in the area and spend more time here, there are farmstays available in the area. Rotorua is a city on the southern shores of Lake Rotorua, in the Bay of Plenty region. It’s a small city, but it is absolutely packed with things for tourists to do. Expect to act like a tourist in this city, because that’s what it’s all about. Below are a few of the quirky things to do in Rotorua. Have you ever soaked in a mud bath? Hells Gate Mud Spa and Geothermal Park, located in Rotorua, is a total tourist gimmick, I’ll admit — but certainly a unique experience. You’ll spend about an hour walking around the geothermal park, watching mud boil and pools of scalding water sputter and spit into the air. Then you can change into your swimming suit and climb into one of the spa’s mud baths, where you’ll spend about 20 minutes rubbing geothermal grey mud on your faces and backs. After the mud bath, you can get into the Sulphur Spa, complete with a refreshing waterfall, to rejuvenate the skin. Details: The park is about a 15-min drive outside the city. You can book 3 different packages – we recommend not leaving out the geothermal walk. It’s one of the best parts. PRO TIP: Your swimming suit will never completely recovered from being immersed in a pool of muddy sulfur water. We recommend taking a cheap swimming suit that you’ll wear just for this activity and throw away before leaving. That’s right – another touristy activity! But you can’t really pass up a chance to visit Kiwifruit Country. It’s a 40-min drive from Rotorua. According to their website, the 60-hectare ‘Longridge Orchard’ has over 30 canopy hectares of Zespri Green and Zespri Gold kiwifruit”. 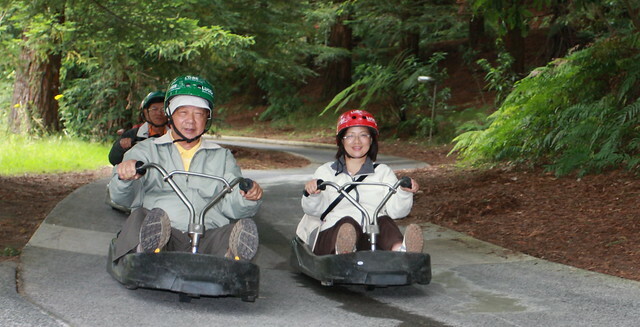 A visit includes hopping on the KiwiKart for a tour of the orchard and grounds. You’ll learn all about the growing process and why this part of the country is able to grow such exceptional fruit. After the tour you can visit the shop and get some kiwi ice cream or try some kiwi liquor. Details: Adult tickets are $20 NZD, child tickets are $6. From Sept – April, tours run on the hour from 9am to 4pm. From May – June, tours from on the hour from 10am to 3pm. Rotorua is truly an adult playground. There are so many options for adventure. One of our favorites is the Skyline Rotorua Gondola, which takes you up to the top of Mount Ngongotaha, where you’ll have a 180-degree view of Lake Rotorua and the surrounding city. Up top there are so many things to do. You’ll want to take a hike around the various trails, take a turn (or 3 or 4, like we did) on the fast-paced luge ride, go ziplining through the trees, or ignite incredible adrenaline on the Skyswing. As you can tell, this is a great place for families who like to have fun. When you’re done playing, you can take a break at the Stratosfare Restaurant, which is open daily for lunch and dinner. For a quick bite, there’s also the Market Kitchen Cafe. Afterwards, be sure to save some time to stop by the Volcanic Hills Winery & Tasting Room, where you can taste up to 5 of their wine. Details: Open daily year round at 9am. Each of the activities has different opening times, so check the website in advance. For dining and the winery, be sure to make reservations in advance. One of the major activities available in Rotorua is golf. Hamurana, Arikikapakapa Rotorua Golf Club, Government Gardens, and Springfield are all world-class courses. In fact, Springfield is a Championship course. Hamurana is a nine-hole course. No matter your playing level, there’s somewhere great for you to play golf in Rotorua. OGO Rotorua is the original inventor of this crazy activity, where you dive into a large orb filled with water and get rolled down a hill either by yourself or with friends. OGO has a couple of different trail options, including a 250-meter straight track so you can race friends in another orb, and the world’s longest 350-meter twisty track with six corners that zigzag back and forth down the hill. It’s not a cheap ride, but definitely one you won’t forget. The facility also has a great view of the lake to enjoy while you’re waiting around. The forest is a great place to go mountain biking or hiking. There is an extensive network of biking and walking trails. There are many California coast Redwood trees in the forest to admire, as well. There are six sign posted walking tracks starting from The Redwoods Visitor Centre and I-Site that cater for beginners and leisure walkers through to hikers looking for an extra challenge. Check out this list of short walks to get started. If you’re not geysered-out, make one last visit to the Wai-O-Tapu wonderland park, home to Lady Know Geyser, which erupts everyday at 10:15am. There are also mud baths and sulphur pools to see along the self-guided walking tour. Once you’ve finished looking around, there’s a cafe so you can refuel before you get on the road. Details: The park is open every day 8am to 5pm (6pm in summer). Tickets for the park and the Lady Geyser show are $32.50 for adults, $11 for children. We often really appreciate the convenience of a suite rather than a hotel room. The Quest Rotorua has everything you need, from a kitchenette to a washer and dryer. The location is very central and makes getting around easy. The rooms are very nice, clean and comfortable. For B&B style accommodations, check out the Hamurana Lodge. It’s a gorgeous property with a nice view of the lake and peaceful surroundings. The hosts do everything they can to make you feel at home, including providing a wonderful breakfast. Atticus Finch – Tasty food, lots of choices, well-presented. There’s also a great outdoor patio. Lake Taupo is a water-filled volcanic caldera that feeds into the dramatic Huka Falls and creates numerous hot springs around the area. The lake is a beautiful place to play, whether you enjoy fishing skiing, geothermal walks, lake cruises, kayaking – well, Lake Taupo has it all. A stay in the town of Taupo will put you in close proximity of all of these fun and exciting activities. This is a busy schedule, so you’ll have only one day to enjoy the activities around the lake. That’s why we’re not going to list out the things to do here. You’ll want to pick your favorite activity from the list above and look into how you can make that happen in your free day. PRO TIP: We personally think one of the best ways to spend the day is on a walk. Check out these great walks to get your started. Because there’s never enough time, we don’t recommend staying overnight in Taupo. Instead, drive on to Hawke’s Bay and stay the night there (see the end of the next section for hotel recommendations). 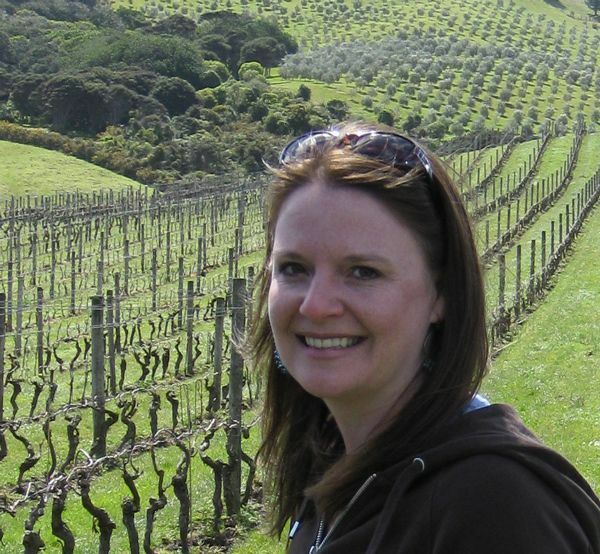 If Hawke’s Bay is known for anything, that’s its beautiful beaches and world-class wineries. The wineries are a big draw for us, and that’s why Hawke’s Bay is included in our Savored Journey’s itinerary. The town of Napier is a great central location to use as a homebase in Hawke’s Bay. It’s also a cute and fun art deco town. You may wonder why they chose this architectural style – it’s because of an earthquake that leveled the town around the time art deco was popular. Now it stands as a brilliant display of the quirky and fun style. Things to see in Napier include the National Aquarium of New Zealand, MTG (the cultural center of Hawke’s Bay – it’s a museum, theater and gallery), Marine Parade, and the Hawke’s Bay Museum. But let’s not get too sidetracked, the purpose of the trip to Hawke’s Bay is to do some wine tasting! There are no less than 70 wineries in Hawke’s Bay. You can easily put together your own self-guided wine tasting tour, if you have a designated driver. If you don’t and would rather leave the planning up to someone else, check out this comprehensive list of wine tours you can book in the area. For a change of pace, why not go on a self-guided biking tour through the vineyards (book here). Napier is a good homebase for your time in Hawke’s Bay. You’ll definitely want to stick with the charming art deco theme. We recommend the Masonic Art Deco Hotel not just because it’s very stylish and fun, but because it’s in a great location, and the rooms are very comfortable, with all the amenities you need. One of the joys of visiting a wine region is the ability to have a nice lunch or dinner in the vineyard with wine pairings. You’ll find a nice lunch enviornment at many of the area wineries. Two that you shouldn’t miss are Elephant Hill Restaurant and Mission Restaurant. Both are open for lunch and dinner (hours vary). Be sure to make reservations in advance. You can drive back to either Auckland or to Wellington to end your itinerary and catch your flight home. We hope you’ve enjoyed this North Island New Zealand itinerary. You knew it was going to be packed full of stuff! We tried to warn you. The thing is, you’ve not even seen a portion of the New Zealand’s North Island with this itinerary. It’s just a small taste. With so many quirky things to do on New Zealand’s North Island, you’ll need to take a separate trip to see the rest. What are your favorite things to do on New Zealand’s North Island? If we left anything out of this itinerary that you think should be added, let us know in the comments. This entry was posted in Itineraries and tagged New Zealand. There’s a ridiculous amount to do in New Zealand! I’ve done all of these too except the luge. ..I really should give it a go before I leave! Zorbing was amazing, my friend and I were I fits of giggles as we sloshed together on the winding course. And I was one of THOSE people at hobbiton…running down the path yelling ‘I’m going on an adventure’. I had to do it twice, my friend missed filming it the first time…luckily I’m not easily embarrassed! Very glad to hear it, Annabella! Rotorua is a great city. Hell’s Gate was amazing – we were there in 2011. Saw an advert for it while we were in Fiji and determined to do it and it was the highlight of our trip. One piece of advice was key – you can hire a swimsuit, both sexes, so that your own stays sulphur free. Note too that all silver jewellery goes black, but reverts once you are a couple of days away from Rotorua! That’s a great tip, Susan. My suit was pretty gross afterward. It took a couple of deep washes to get that smell out. it was a great experience though. Totally worth it. Kiwi 360 is now closed unfortunately. Te Puke is full of kiwi fruit orchards but you can’t go on them as a visitor but you can see from the roads. I thought Kiwi360 opened in a new home and is now called Kiwifruit Country. It looks to still be open.